Tropical Storm Hermine: GFS model forecast at 8 a.m. Sunday (top-left), NAM model forecast at 8 a.m. Sunday (top-right), and the latest forecast track from the National Hurricane Center (bottom). The latest data suggests the Hermine will hug close to the Atlantic coast, raising New Jersey's chance for weather and surf impacts over the Labor Day Weekend. If you're hoping for a beautiful, sunny, warm, perfectly pristine Labor Day Weekend, I have some potentially bad news to share... Tropical Storm Hermine may have other plans. Tropical Storm Hermine update from the National Hurricane Center, as of 2 p.m. Wednesday. The white cone indicates the likely realm of possible locations of the center of the storm. As of 2 p.m. Wednesday, the National Hurricane Center (finally) upgraded Tropical Depression 9 to Tropical Storm Hermine. (Pronounced her-MEEN, by the way.) Currently located about 450 miles southwest of Tallahassee, Florida, Hermine is packing maximum sustained winds of 40 mph, and is barely moving northward at 2 mph. The storm is expected to make landfall along the Florida Panhandle and Florida's Nature Coast late Thursday. After pushing inland across Florida, Hermine is expected to continue pushing toward the northeast, through coastal Georgia and South Carolina. As it reenters the Atlantic Ocean on Friday, the forecast gets tricky. Over the past day, forecast models have made a definitive shift westward in the forecast track of Hermine as it parallels the U.S. East Coast Friday and Saturday. Obviously, the further west the storm trends, the bigger the headache for New Jersey. While it originally appeared New Jersey (and the rest of the mid-Atlantic states) would be spared from any direct impacts from the storm (wind, rain, etc.) that's no longer certain. Confidence remains shaky, as this forecast continues to evolve, so it's not time to ring alarm bells and panic yet. The heightened chance for a tropical storm in our midst over a holiday weekend means we all need to stay extra aware of the forecast as it continues to evolve. By the time the center of the storm exits the mainland Friday morning, we should have a much clearer picture about its next step. 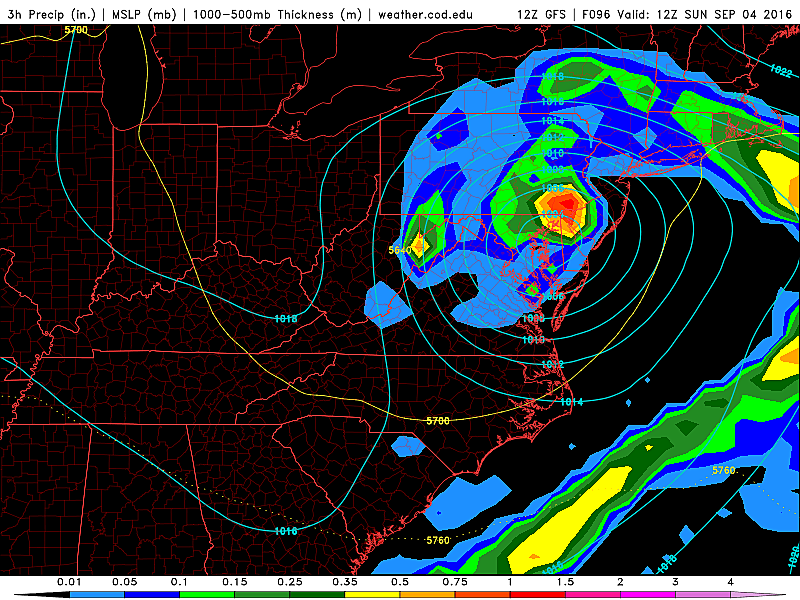 --Timing: Impacts could be felt in NJ as early as Saturday afternoon. Most significant storm effects would be from Saturday night to Sunday morning. Storm would taper off as the storm moves away Sunday night. --"Only" a Tropical Storm: The vast majority of models keep Hermine a tropical storm for the duration of its journey up the Atlantic coast (through about Monday). But please don't let your guard down because "it's not a hurricane". Irene was "only" a tropical storm when it battered New Jersey five years ago, remember? Focus on the potential weather and surf impacts and how they might affect your weekend plans and personal safety. Ignore the hype and the drama. --Sure Bet: We're already experiencing rough surf and a "moderate" rip current risk along the Jersey Shore, thanks to Hurricane Gaston and Tropical Depression 8 stirring up the Atlantic Ocean. A close pass by Tropical Storm Hermine would likely push waves even higher and increase our rip current risk to "high". Even if NJ doesn't see a drop of rain or a gust of wind from Hermine, the ocean is not going to be friendly at all throughout the Labor Day Weekend. --Other Potential Impacts: The technical definition of a tropical storm requires sustained winds between 39 and 73 mph (34 to 64 knots). Even at the low end of the scale, 40+ mph winds can easily down trees and power lines, make driving very difficult (especially in driving rain), and cause damage to roofs and structures. Coastal flooding due to storm surge is also something to watch, although I'm not ready to hazard a guess as to the magnitude of this factor at this time. --Could It Shift Back East? Absolutely! That's why I think we'll be able to provide a much more confident forecast on Friday morning, as the storm moves off-shore. If the track shifts east, we could very well still enjoy a dry and mostly sunny holiday weekend. Keep fingers crossed! As always, we'll be watching this developing situation closely. When we know something new, you'll know.